This week I am delighted with a shipment of new artwork that has arrived for us here at Governors Estate. Bob’s son Cassius Colman and his partner Jessie Dyer have a great art gallery in London called Nelly Duff and when we saw a range of limited edition prints that they were selling by UK artist Nick Smith we were both very keen to collect them. In our bedroom – A Bigger Splash – remember by David Hockney …. As his biography on the website states ” Glasgow born artist, Nick Smith produces striking versions of iconic artworks, with the exclusive use of Pantone swatches. Lola – the lovely Frame Studio dog. 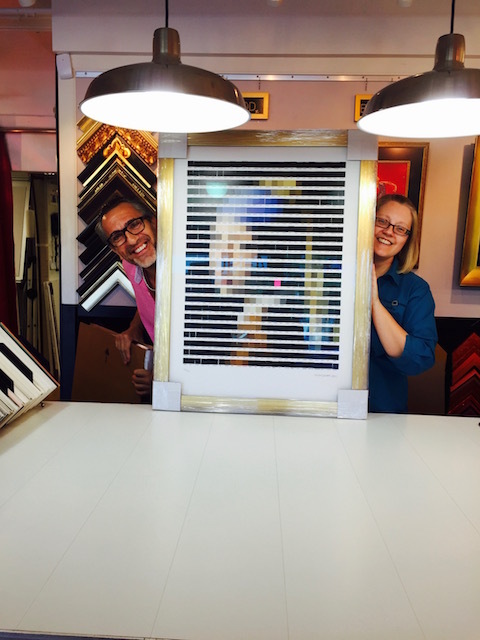 Great selection of frames – this is only one section …. I particularly liked a range of lacquered frames – maybe I will use one of these for a future project. The framed prints were carefully packed and protected for shipping and finally they arrived here. Mona Lisa waiting for a home ! Moving existing pictures around when you get new ones is a great way to refresh your collection ! Wow! Quite an ingenious use of color palettes. Thanks – we love them ! Do you have any art by Bahamian artists? No but I know a lot of them. I used to be the librarian at NAGB. I love that gallery ! I also have a great local artist from here in GH – Tripoli Burrows – the son of Bill Burrows who I interviewed for this week’s blog …..